Hopefully, this will turn out to have been a waste of time. The Texas House and Senate have approved a deal to relax the state’s voter identification requirements, meaning the closely watched legislation now only awaits Gov. Greg Abbott’s approval. The Republican is expected to sign Senate Bill 5, capping a flurry of late activity that pushed the legislation to the finish line after some state leaders feared its demise — and legal consequences from inaction. The House approved the compromise bill Sunday in a 92-56 vote — one day after the Senate backed the deal along party lines. Sen. Joan Huffman’s bill, which would soften voter ID requirements once considered strictest in the nation, responds to court findings that the current law discriminated against black and Latino voters. 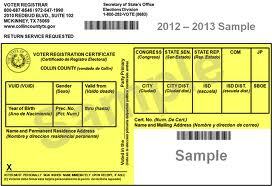 Under the final bill, Texans who own qualifying photo ID must still present it at the polls. Those include: a state driver’s license or ID card, a concealed handgun license, a U.S. passport, a military ID card, a U.S citizenship certificate or an election identification certificate. Such IDs may be expired up to four years, thanks to a provision in the House bill that survived the compromise. Voters 70 years and older may use such IDs expired for any length of time. The final bill stripped some provisions from the House legislation, including requirements that the secretary of state to study ways to boost the state’s perennially low voter turnout and that the agency reveal details — currently withheld — about its spending on voter education efforts. House Democrats on Sunday voiced disappointment with those changes. See here and here for the background. I’m sure the state and the Republicans didnt want to go into the June 7 status call with Judge Ramos empty-handed, but I really don’t see how this bill changes anything. It (barely) mitigates the effect of the 2011 voter ID law, but does not – cannot – address the discriminatory intent of the law. Add in the completely half-assed way the state implemented the court-ordered mitigations in 2016, as well as its refusal to be transparent about those efforts should make it clear that they are trying to do the tiniest minimum to get out from under the court order. The only answer here, the only way to get their attention, is to throw the law out entirely, and invoke Section 3 to make it harder for a new voter ID bill to get passed. Here’s hoping.